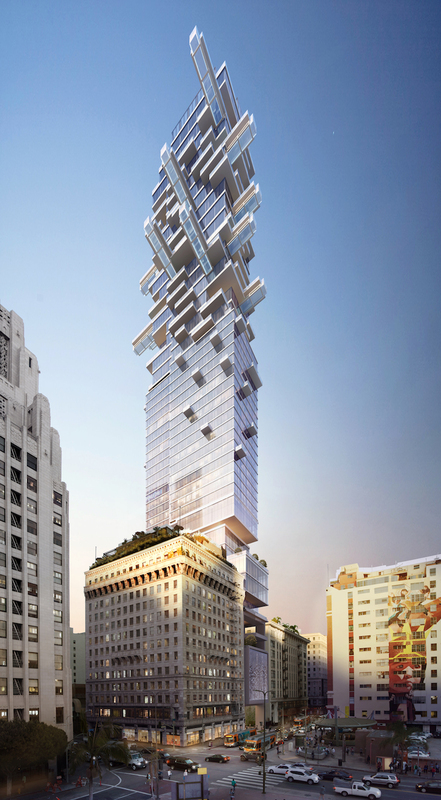 On a slender L-shaped site next to downtown Los Angeles’ Pershing Square Building, a planned 53-story, 784-foot-tall glass and steel tower would feature a mix of hotel rooms and residential condominiums. The building will be elevated and separated into a podium and a tower. Currently, there are two use options under consideration for the tower. Both options would span 260,689 sf and include amenities such as restaurant, bar, and fitness facilities. Option A would split the tower between condominium space and hotel space. It would include 16 two-bedroom units, 14 three-bedroom units, and one four-bedroom unit for a total of 31 units. The hotel portion would include 190 rooms and a 10,000-sf ballroom. Option A would also include a 2,242-sf fitness room, a 2,400-sf pool deck, 6,119 sf of meeting space, up to four restaurants and bars totalling 29,232 sf of commercial/restaurant space, and 126 parking spaces. Courtesy Arquitectonica and JMF Development. Option B would eliminate the hotel aspect and include 87 one-bedroom condominium units, 52 two-bedroom units, 20 three-bedroom units, and 1 four-bedroom unit for a total of 160 units. Option B would feature a 2,119-sf fitness room, 2,400-sf pool deck, 3,358-sf roof garden, up to four restaurants and bars totalling 20,431 sf of commercial/restaurant space, and 187 parking spaces. In option A the podium height would be 95 feet, in Option B it would be three feet taller at 98 feet. 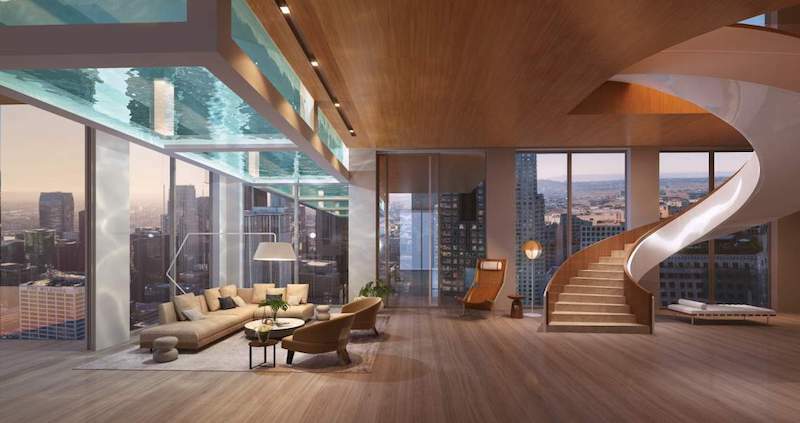 In both options, the new building would connect to the existing Pershing Square Building at the top of the podium and via a sky lobby on level 13. The building’s most striking features, however, are the 12 cantilevered pools between floors 39 and 51. The glass-bottomed pools would extend from 12 individual condominium units and take on a long, thin appearance like lap pools. Arquitectonica is the architect for the project and JMF Development is the developer. The building, if approved, is slated for completion in 2023. 44-acre mixed-use project completes in Northridge, Calif.
Ware Malcomb designed the project.